BURNS, Ore. - The militia group at the center of a standoff on the Malheur National Wildlife Refuge in Oregon said they are occupying federal land in protest in order to restore the constitution. Ammon Bundy -- the son of Nevada rancher Cliven Bundy, who was involved in an armed standoff with the government over grazing rights -- said his group will stay there as long as it takes to see justice served. On Monday, he told reporters that the collective of protesters had decided to name themselves "Citizens for Constitutional Freedom." The case that brought self-described armed patriots from across the country to Oregon involves a pair of Oregon ranchers convicted of burning federal land. And while the milita group insists they are acting in support of the Hammonds, the Hammonds say they don't want the protesters at the refuge. The sheriff said Monday afternoon that the Oregon ranchers convicted of setting fire to federal land have turned themselves in. Federal authorities made no immediate attempt to retake the Malheur National Wildlife Refuge in the remote high desert of eastern Oregon. There appeared to be no urgent reason for federal officials to move in. No one has been hurt. No one is being held hostage. And because the refuge is a bleak and forbidding stretch of wilderness about 300 miles from Portland, and it's the middle of winter, the standoff is causing few if any disruptions. Bundy said Monday his group wants authorities to look into claims that local ranchers have been intimidated by the federal government. Bundy speaking from the wildlife refuge, said his group has sent a "demand for redress" to local, state and federal officials. They want a response within five days. Bundy didn't say what the group would do if they didn't get a response. Earlier Monday, Bundy told "CBS This Morning": "The wildlife refuge has been a tool that government has used for many years to take the land and resources away from the people. The people of this county are being abused and they're being prosecuted because they're not willing to sell to the federal government, and it's just one of those things that just cannot continue." Ammon Bundy told "CBS This Morning" they're armed because "we need to defend ourselves." 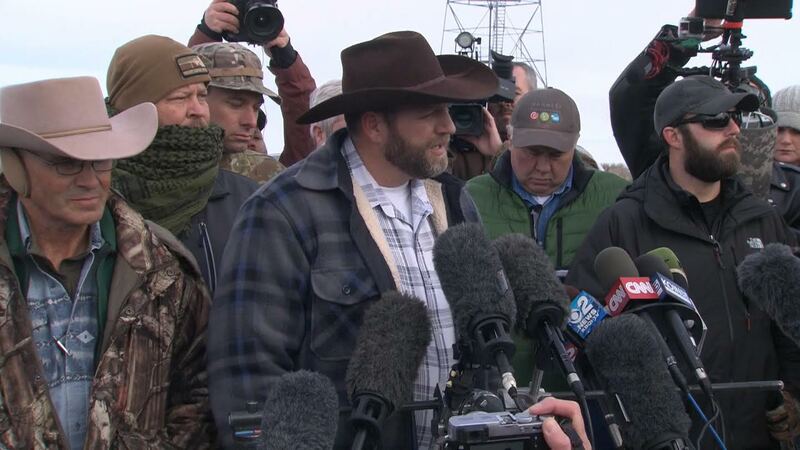 "There is an imminent threat towards us and it is our right to do that," Ammon Bundy said. "But also we are serious. We are serious about being here, we're serious about defending our rights and we're serious about getting some things straightened out, but we have no intention on using any type of force, intimidation. Those are not our methods." Tension had been building for weeks in the eastern Oregon over the case of Dwight and Steven Hammond, who turned themselves over to authorities Monday. Dwight Hammond, 73, and son Steven Hammond, 46, said they lit fires on federal land in 2001 and 2006 to reduce the growth of invasive plants and protect their property from wildfires. The two were convicted three years ago and served time - the father, three months; the son, one year. But in October, a federal judge in Oregon ruled their terms were too short under U.S. law and ordered them back to prison for about four years each. The FBI has taken charge of law enforcement efforts to bring a peaceful end to the situation. Many have questioned why there hasn't been a more aggressive law enforcement approach to ending the situation, which is taking place in a sparsely populated part of the state.